In a live theater, theater terminologies such as Upstage, Centerstage, Downstage, Stage Left etc. are used as a guide to the performers and technicians while staging a production. 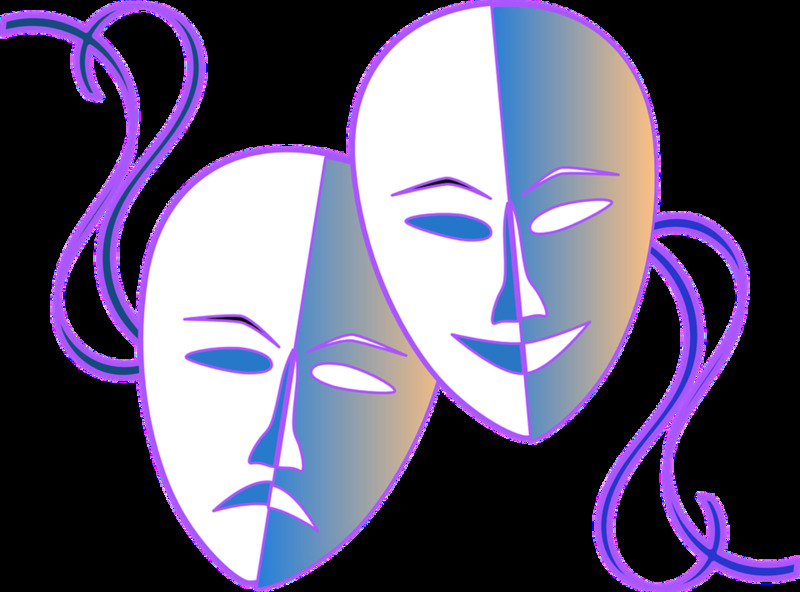 Performances take place in different types of theater stages, which are associated with different types of theater arts. A performance may be staged in a Proscenium Theater, Arena Theater (Theater in the Round), Thrust Theater, Alley Theater etc. However, Proscenium Theater is widely used performing space in live theater, and most of the theater terminologies derive from proscenium stage. These theater terminologies also apply to some other theater forms. A proscenium stage consists of a large archway in the front, and wall or curtain on three sides. The performance takes place on the space behind the archway. Proscenium stage is raised from the Floor of the House (Auditorium Floor). 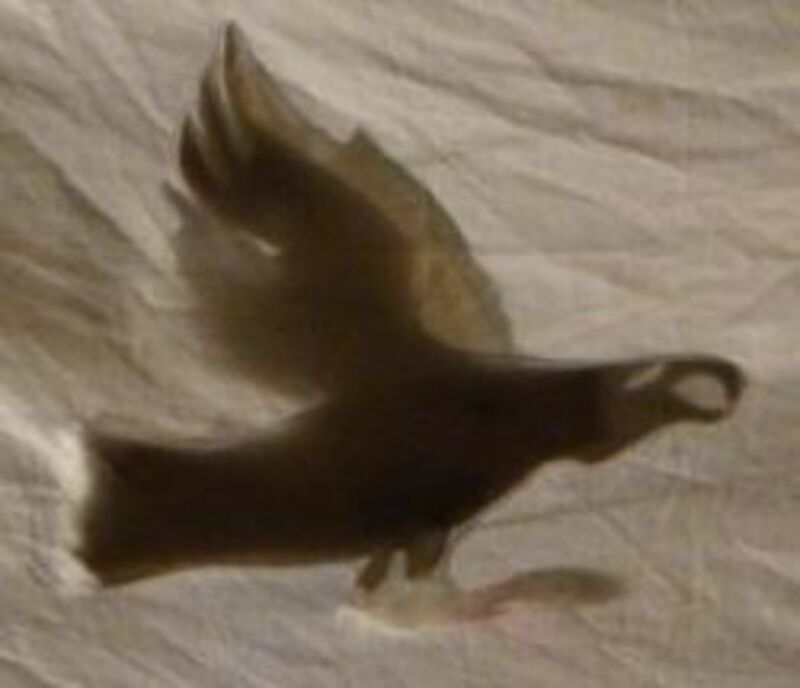 A curtain hides the stage from the audience, and it is raised when the performance begins. The area in front of the curtain and archway is called apron, which is normally used for the announcements. 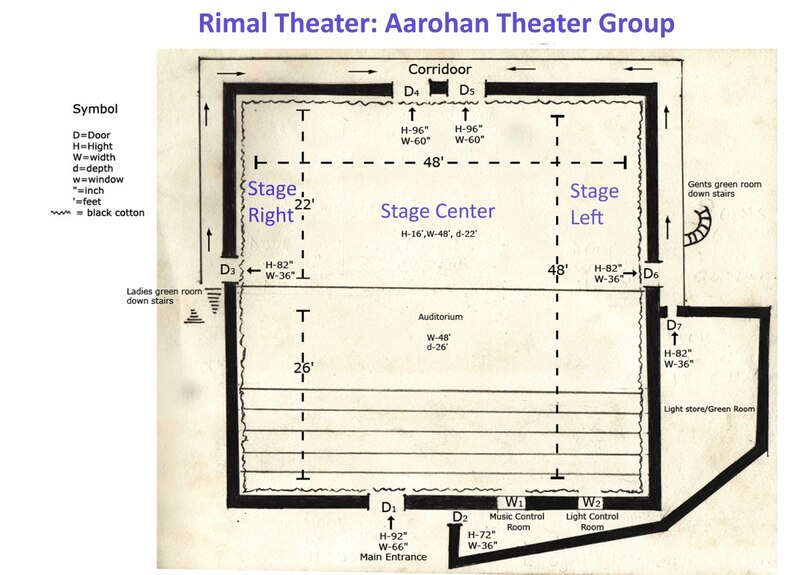 In order to help the performers properly utilize the stage area, the performing space is divided into different segments. The division of theater stage is for purpose of stage direction. During the rehearsals, the director uses stage direction as instructions to the actors to position or move to the different area of theater stage. Theater technicians use stage direction as a guide to do the lighting and set design. The performing space, or the theater stage, is divided into five columns and three rows. 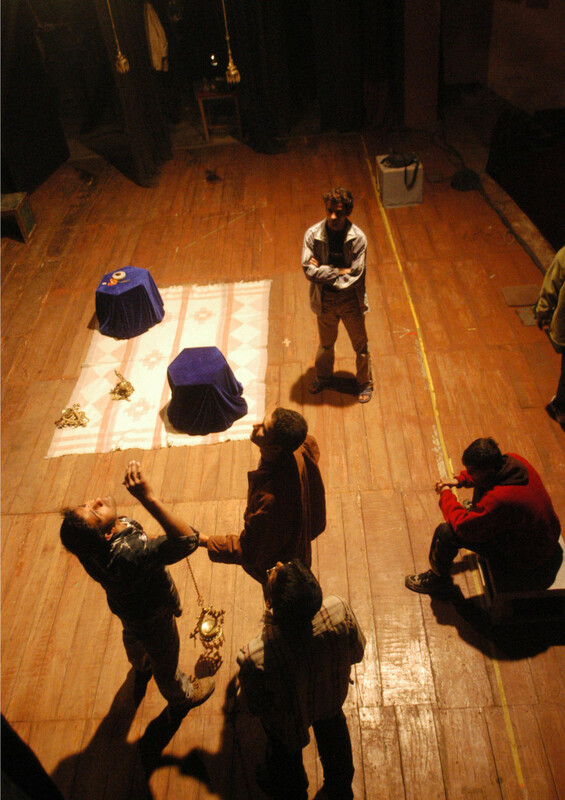 Actor’s position is taken as a guide while dividing the theater space. Downstage, Upstage and Centerstage are the horizontal divisions of a theater space. Downstage is the front part of the stage. The performing space close to the audience or the proscenium arch is called downstage. Upstage is towards the back of the performing area. The stage area farther from the audience and close to the backstage is called upstage. Centerstage divides the stage into left and right, and up and down. It is the area in the middle of the stage. The center area between Upstage and Downstage, and Stage Left and Stage Right is called Centerstage. Backstage is the area behind the performing space, which is separated by a wall or curtain. Backstage is used as Green Room. Onstage is the area on the stage where performance takes place. Offstage is the area on the stage which is not visible to the audience. House is the area where audiences sit and watch the performance. Auditorium or the audience position is generally referred as the House. The Floor of House is the floor in the auditorium, which can be at the same level to the stage or below or higher than the stage level. Are you familiar with theater terminologies? 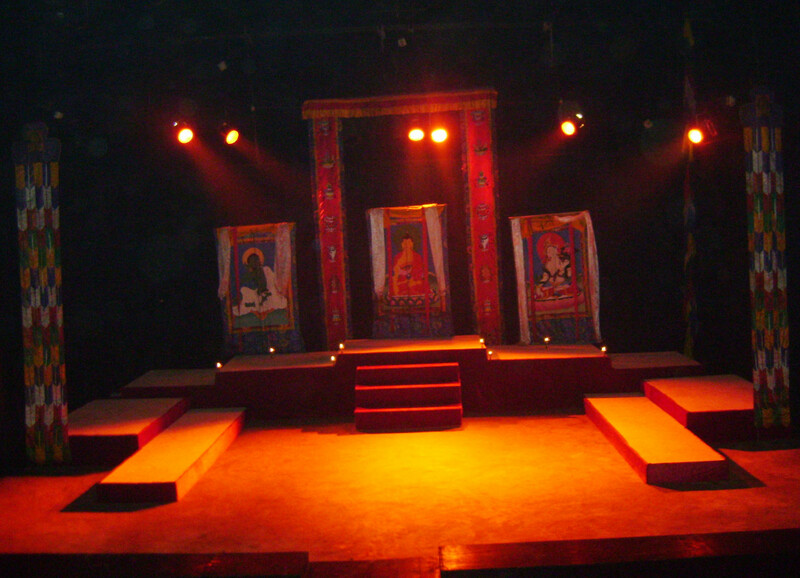 The stage is divided into different categories assuming the actor is standing in the middle of the stage facing the audience. Left side of the actor is Stage Left, and right side is Stage Right. 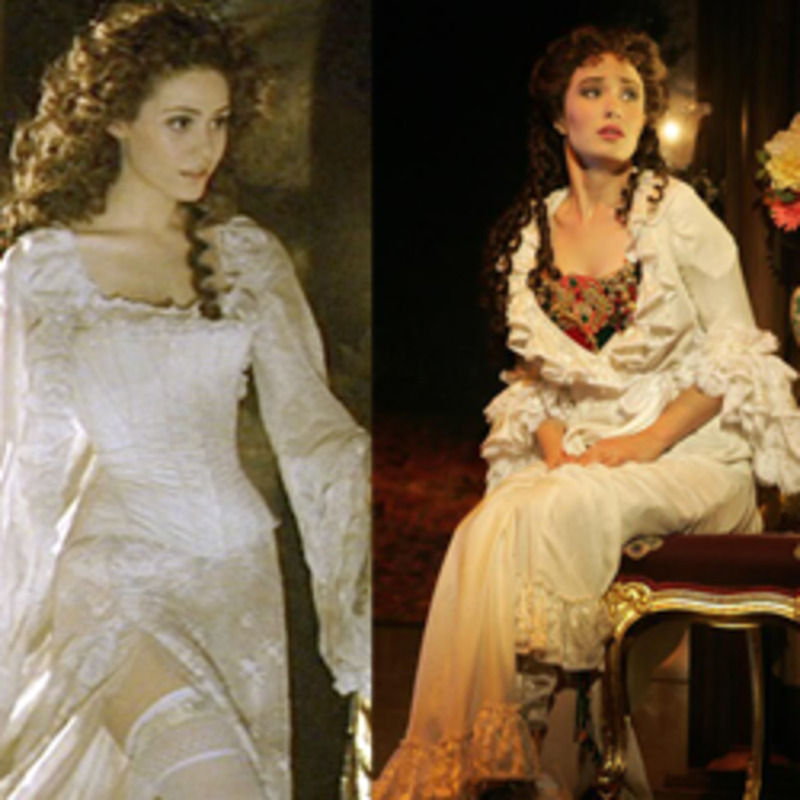 During the performance, the actor may face different directions such as left, right or back, however, Stage Left or Stage Right will always be the same area. Stage area does not change according to the position of the actor during the performance, but determined by assuming the actor is facing the audience. 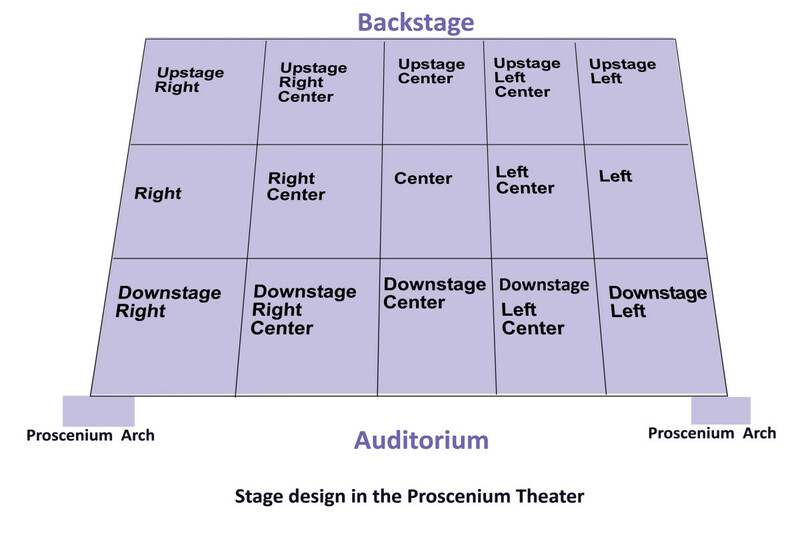 Upstage, Centerstage, and Downstage are horizontal divisions of the theater stage. Vertically, the stage is divided into five columns: Stage Right, Stage Right Center, Stage Center, Stage Left Center and Stage Right. The vertical and horizontal division help the actors change their positions, or move to different area of the stage. Theater stage divisions also help the lightman to do onstage lightning during the performance. The division of a theater stage is according to the position of the actor, which is normally assumed that he/she is in the middle of the stage and faces the audience. As the actor stands in the middle of the stage, facing the audience, right side of the stage is called Stage Right. Stage right can be Upstage Right, Right or Downstage Right. Extreme right of the actor is called Stage Right, and the area just on his right is called Right Center. Horizontally, Stage Right Center is divided into Upstage Right Center, Right Center, and Downstage Right Center. As the actor stands in the middle of the stage, the space where he/she stands is called Stage Center, back of the actor is called Upstage Center and the space in front of the actor is called Downstage Center. The area just on the left side of the actor is called Stage Left Center. There are three division of Stage Left Center: Upstage Left Center, Left Center and Downstage Left Center. The area in the performing space, which is extreme left to the actor, is called Stage Left. There are three different categories of Stage Left: Upstage Left, Left and Downstage Left. 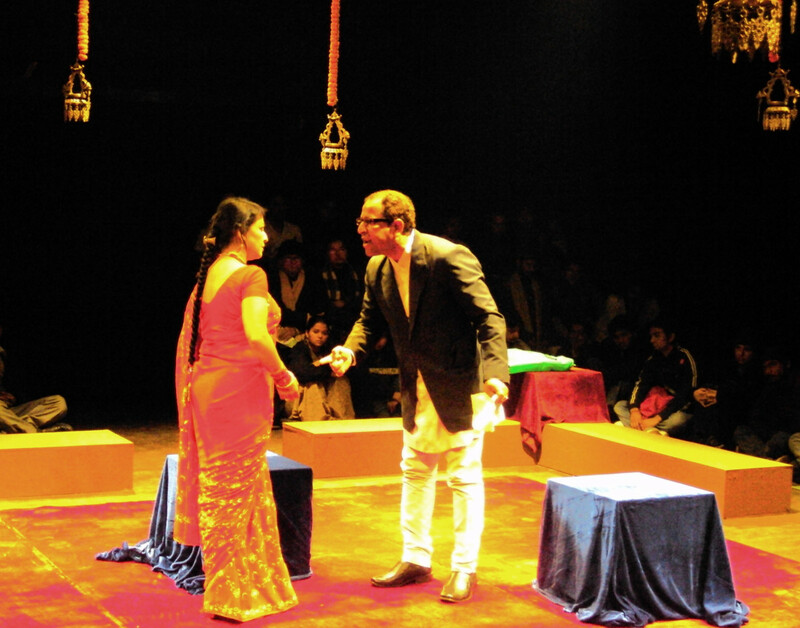 Theater terminologies such as Stage Left and Stage Right are used in blocking a play. Blocking are the instructions used while giving stage directions to the actors. Stage Left and Stage Right is according to the viewpoint of the actor, whereas House Left and House Right is determined from the perspective of the audience. Stage Left is the left side and Stage Right is the right side of the stage according to the actor’s perspective. House Left and House Right are left and right of the stage from the audience's perspective. Since the viewpoint of the actor is opposite from the audience, left and right are different. When the actor moves to the left of the stage, he is actually moving to the house/audience right. When the actor moves to the right of the stage he is actually moving to the left of the audience. Therefore Stage Left is House Right, and Stage Right is House Right. I was privileged to watch a set in construction for PhAntom of the Opera this spring. After reading your post, I can visually see the stage locations. Thanks for the education. @Marie, I was into actin when I was a kid. But later in life other things took the center stage. Thanks for sharing your views. @Till, thanks for taking time to read and leave a wonderful comment. There are many of us who are unfamiliar with all of the terminology you've explained here. This is a great education for anyone wanting to learn more about theater or wanting to get involved in theater! Dear Vinaya, when I was a teenager I received acting classesand even participated in some plays, but never get to know all what you explain here!!! Thank you! thanks for your generous feedback. Amazing hub ! From start to finish you will be full....Voted up ! @Billy, thanks for appreciating my work. Have a great weekend. @Faith, I'm glad you learned something new from this hub. God bless you. I was not at all familiar with theater terminology, but now I am. Again, an excellent explanation for those of us who are not well-versed in theater.